Scrubbing is flue gas treatment of poluted flue gases by chemical reaction, like gasses from incineration processes are chemically treated before leaving the chimney. When water (and for example caustic soda - NaOH) is used to clean the flue gas, it is called "wet scrubbing". When there is no water present, the flue gas treatment is named "dry scrubbing". A dry scrubbing is shortly, a dosing of a chemical powder in the flue gas, (ex. : sodium-bi-carbonate), followed by a reaction chamber, and a bag house filter. The powder will chemically react with the acids in the flue gas in the reaction chamber and in the bag house filter. A wet scrubber is shortly, spraying water in the flue gas, so it condensates and mixes/reacts with the chemcial in the flue gas. The use of water creates a danger for corrossion. The corrossion is not from the water, but from the acids like Chlorine in the flue gas. HCl is for example a typical acid creating corrosing, because Cl has its dew point at 142 degr.C, and Cl will create corrossion of the metal structure/ductworks. Dry scrubbing (photo 1) is working from 142 degr.C and higher, so it stays above the dew point of acids like Cl. But dry scrubbing has a limited efficiency, so sometimes a single dry scrubbing is not enough to reach the emission limits. 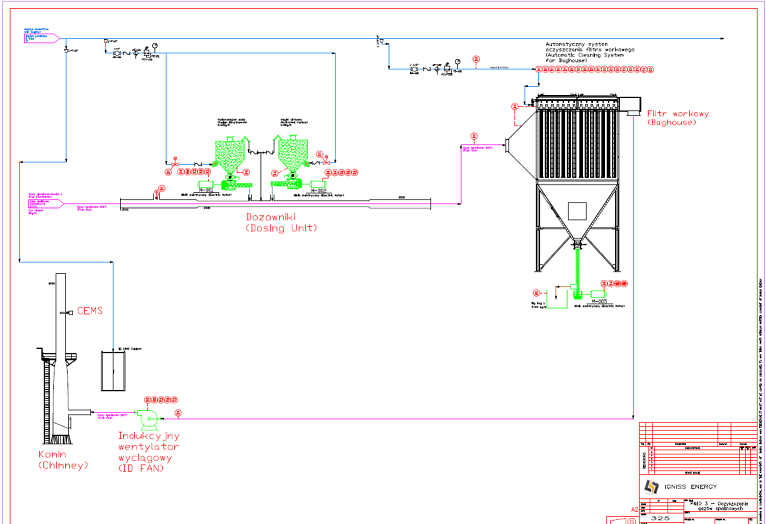 When a single dry scrubbing step isn't efficient enough to reach your emission limits, a flue gas treatment system can be design with a first dry scrubbing system, and in cascade a wet flue gas treatment system (photo 3). 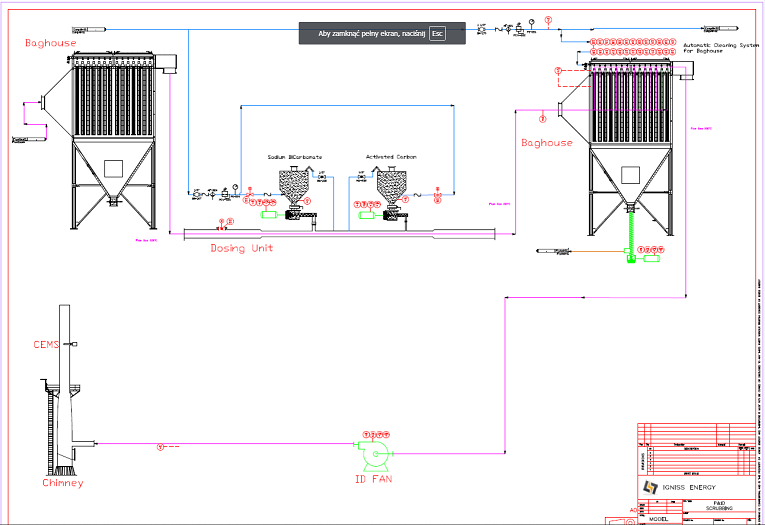 From the dry and wet scrubbing systems, the wet scrubber is most efficient scrubbing system. Because these scrubbers use a lime milk (lime is also used in dry scrubbing), they are not really wet scrubbers, but they use the principle of dry scrubbing with water. This type of scrubbing is called semi-dry (=semi-wet) scrubbing. Packed bed scrubber, this is a very efficient scrubber, but quickly clogging. Venturi scrubber, this is a scrubber mainly used also for dust elimination. Today this type of scrubber is less in use, because of presents of the bag house which is often already eliminating the dust in the flue gas. Centrifugal scrubber, this is also called a low maintenance scrubber. There is a turbulence created in the scrubber, which creates a efficient chemical reaction. Not so efficient like a packed bed, but also the clogging risks are less. Combinations, like a Venturi scrubber, a packed bed scrubber and a demister at the end. A demister is used to create a situation that there is less water consumption. So the water stays in the scrubber, and the plume is less visable on the chimney. Why we do not use all wet srubbers? The wet scrubbing flue gas treatment system generates a wet residue (= the waste of the wet scrubber) is wet. So it has a lot of mass and volume due to the water. This is a salty solution, sometimes extra contaminated with dust. And this is a very expensive waste. To optimalize the costs of flue gas treatment (or scrubbing), dry scrubbing is always a first option. Secondly, if a dry scrubbing is not enough, a wet scrubbing is added in cascade. This set up is in Europe popular, mainly for his costs effectiveness and to comply with the EU emission law for waste incineration. The choose of a scrubbing system not only depends on his investment costs. But also on the operational costs and the available competences. Investment costs are costs connected to the equipment and design know how. The operational costs, are the consumables you need and the residues you will get back from the scrubbing system. Sometimes it will be more efficient to add an extra bag house, just to get the fly ash out of the flue gas, and in a next step do the chemical dry scrubbing (see photo 2). This are just a few examples how to evaluate your choose when designing a scrubbing system for flue gasses.